I decided to paint my nails with an easter/spring theme last week. I love painting my nails (if you don’t already know) because the process is fun for me, and the outcome makes me happy every time I look at my nails. 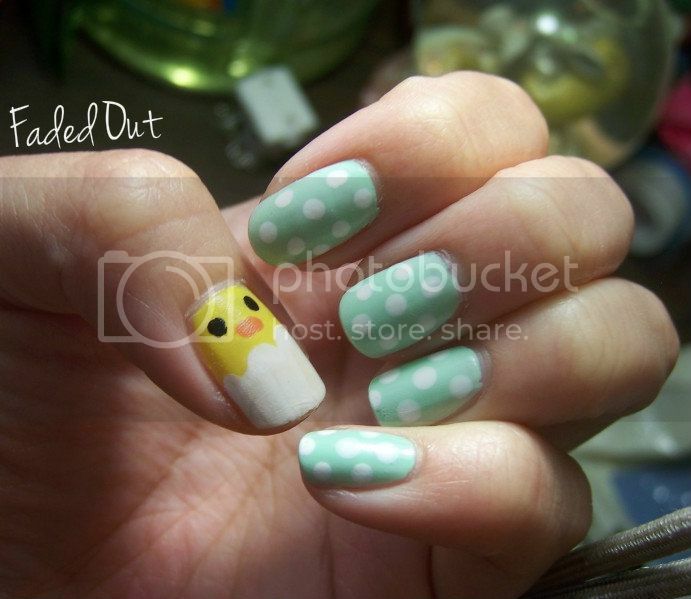 I went with a pastel green color with white polka dots and a little chick on my thumbs. The green color is called Mint Sorbet by Sally Hansen. It came into mind because two weeks ago I painted a friend’s nails, and at first she chose my Mint Sorbet color, but as soon as I applied it to one nail she freaked out at the bright color and decided to go for a less extreme color. I decided pairing the green with some white polka dots would make it look softer and tone down the green a bit. I went for the chickie on my thumbs because when else will I be wearing yellow?! The white egg shell kind of tones down the yellow as well. I’m loving this polka dot deal; I’ll probably do it more often to spice up plain nail polish if I don’t do any designs! P.S. My camera is still M.I.A. (but probably gone forever by now), sadly. However, I put my noggin to use and realized I could use my really old camera that I first had in 7th grade (that was 8 years ago!). It’s missing some screws and has the battery life of 3 minutes max, but it gets the job done if I want to post a quick picture to my blog like this. Those nails look so cute. Normally I do not like nails done. But you did them well. Good luck on your old camera. Awww, your poor boy! It must have been a blood-curdling scream :'( Your Christmas nails sound really cute. No worries, you'll be able to deck out your nails again someday soon! Your nails are really lovely. How do you do that? You're nails are soooo adorable. I would love to so something similar to this. *Sigh* I love nail art. Great job on it! Your nails look so nice! I wish I could do cool things to my nails, haha, but, as it is, all I can do is paint on solid, plain colors, and even then I'm struggling!